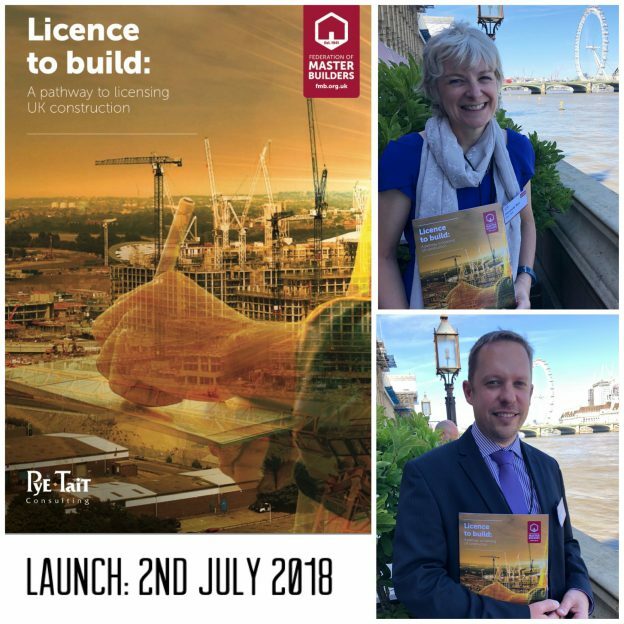 Miranda Pye and Adrian Smith of Pye Tait Consulting were delighted to attend the FMB’s high profile launch of our new research report ‘Licence to Build: a pathway to licensing UK construction’. Guests at the House of Lords event on 2nd July 2018 included MPs, Peers, leading industry stakeholders, journalists and FMB members. They heard about the benefits of introducing a mandatory licensing scheme for the whole construction industry. The report recommends a Task Force and puts forward proposals for how it could work to benefit the industry and consumers. If you’re interested in supporting FMB’s campaign to stamp out rogue traders once and for all through mandatory licensing, please email ExternalAffairs@fmb.org.uk. This entry was posted in Latest Headlines on July 4, 2018 by Nicola Charleton.